This shop doesn't exclusively sell wedding items, but they have a lot of really unique wedding related items nonetheless. 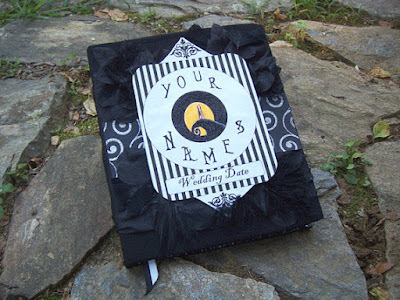 These wedding guest books and spellbooks by Witch on Wheels are really cool! They also carry candles, props, and other miscellaneous goodies. You should just take a look and really see what I'm talking about! Since Maleficent is my favorite Disney villain, I figured I would show this Witch Spellbook first. This is totally decorative, but has her famous chant that you can say over and over again. "Oh poison needle . . . beckon thy prey." "Prick a finger this very day!" "Touch the spindle, touch it I say!" I have always wanted my own set of Sally's potions. This would be great if you are thinking of having a Nightmare Before Christmas party! 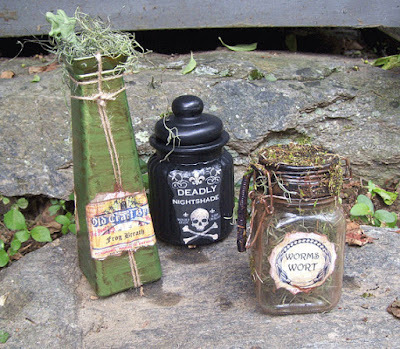 I wish I had a covered garden area, because these potions can be used for decorative purposes. Speaking of Sally, I think the ultimate wedding would be a Halloween Nightmare Before Christmas themed celebration. 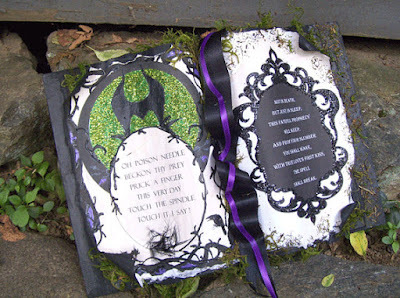 Consider having this Nightmare Before Christmas Wedding guestbook displayed. Maybe someday I can use this for myself! 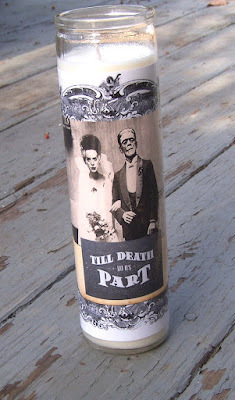 Whether it's Halloween or a wedding, this Frankenstein Bride candle would add to your creepy decor. We all strive to be till death do us part... and beyond. 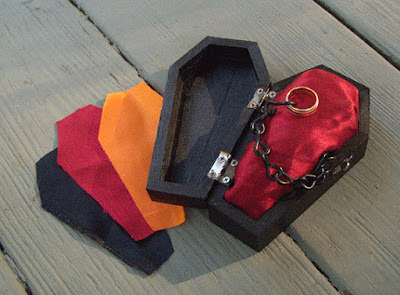 Can you imagine a mini Dracula walking up the aisle presenting this ring bearer coffin? It would be so precious! I am already imagining my dream wedding, I apologize! Though I'm not a huge fan of the movie, I really dig this Hocus Pocus spellbook. There are six spells from the movie inside this disturbing book. Not only that, there are enough pages to write your own spells! 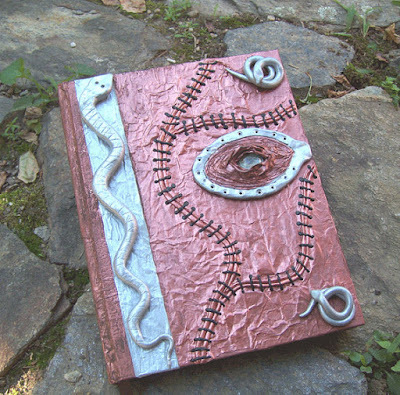 A Life Sucking Potion is also included with this monstrous book. 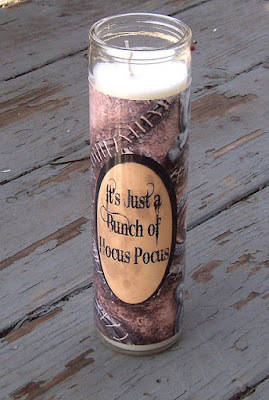 I would get the matching Hocus Pocus candle with the book! If you're a huge Hocus Pocus fan, you could use this for your wedding or just this year's Halloween party. I may have to rewatch the movie on Halloween this year. 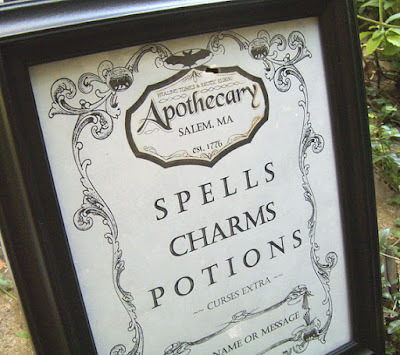 I totally want this Salem Witch Vintage Apothecary sign hanging on my wall. This would be so much fun for a cocktail party. You could create your own "potions" and serve them to your guests to cure their ailments. In all fairness, cocktails are my version of medication. 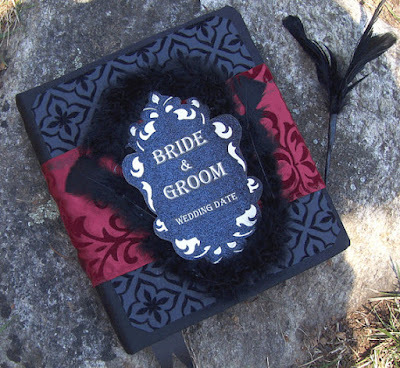 This gothic guestbook is absolutely stunning. I love the Victorian elements along with the feathered pen. You don't even need to have a Halloween wedding to use this! It's elegant on it's own. 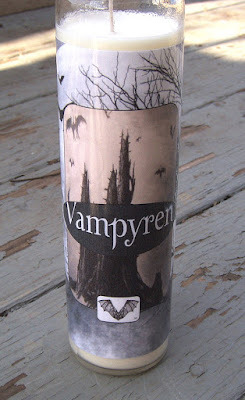 Isn't the vintage illustration on this Dracula candle really cool? Specifically the bats really creep me out! The combination of the gentle vanilla fragrance and style of candle will give your house a haunted feeling. If you are already planning a serious celebration I would definitely see what other items Witch on Wheels on Etsy has. Especially if you're planning a Halloween wedding, this is a store to check! Make sure to comment below!